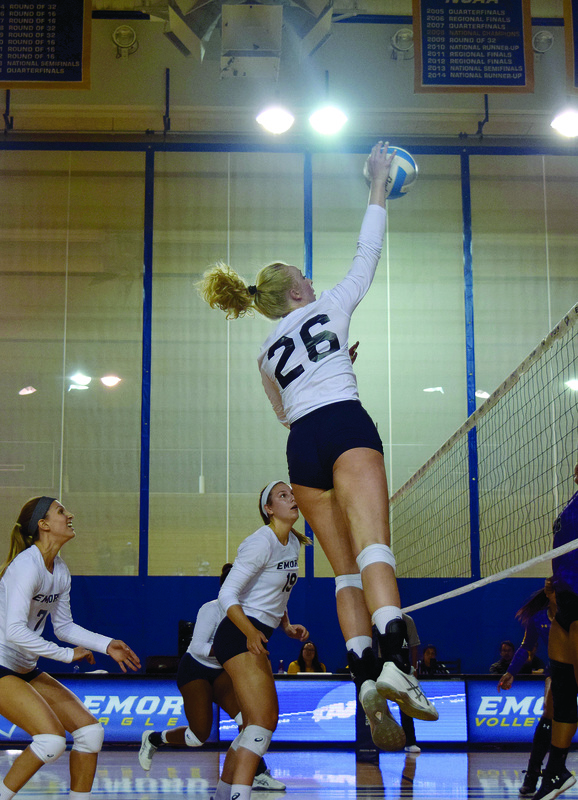 The Emory women’s volleyball team returned to the court for a weekend series against the Whittier College (Calif.) Poets on Aug. 31 and the Illinois Wesleyan University (Ill.) Titans and Covenant College (Ga.) Scots on Sept. 1. The Eagles started the season strong with a 3-0 win over Whittier. They then fell to Illinois Wesleyan 3-1 on Sept. 1 but rebounded with a 3-0 victory over the Scots. The team debuted eight freshman players this season, but it still suffers from the loss of several players who were injured last season. Senior outside hitter Karissa Dzurik made a comeback as a key asset for the Eagles after studying abroad last semester. She scored a total of 23.5 points over the course of the team’s three games. Junior outside hitter Sara Carr also made her return this weekend but only to the back row, waiting a few games to fully assume her usual position at the net. 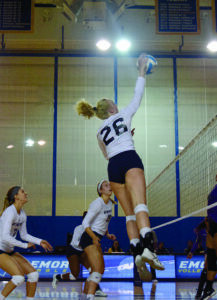 Senior middle hitter Sydney Leimbach is expected to return this weekend for her first game of the season after missing the majority of last year. The team’s new talent also suffered injuries. Freshmen middle hitter and right side Roisin O’Dowd and middle hitter Kaia Johnson are both out with shoulder injuries, while right side Ashley Brennan is benched with a knee jury. Freshmen outside hitter Tara Martin and middle hitter Charlese Blair were injured prior to the season’s start but are now back to playing. In the first game against Whittier, junior outside hitter Morgan McKnight led the team in kills with 17 total. Sophomore right side Leah Saunders trailed her with 13. Emory worked off the momentum of the first game to win the first set against Illinois Wesleyan 25-12. However, the Titans came back in the next three sets to attain a narrow victory. The Eagles fell 22-25, 20-25 and 23-25, respectively. After the weekend’s results, McDowell said the team is focusing on improving blocking skills as well as continuing to build upon serving and passing. “And communication can always get better, even though —if you’ve been to one of our games — you know we’re a pretty loud team,” Yohann added. Looking ahead, the Eagles face a busy schedule of tough opponents. The Eagles will host the Emory National Tournament next weekend, where they will face Transylvania University (Ky.) on Sept. 6 at 7 p.m. and Otterbein University (Ohio) and Berry College (Ga.) on Sept. 7 at 4:30 p.m. and 7 p.m., respectively. The Eagles will finish out the tournament with games against Whitworth University (Wash.) and Tufts University (Mass.) on Sept. 8 at 1:30 p.m. and 4 p.m., respectively. Editor’s Note: Karissa Dzurik (19B) is a senior staff writer for the Emory Wheel.